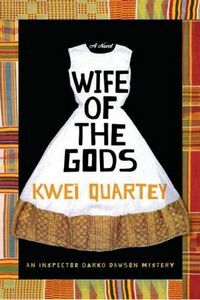 Wife of the Gods by Kwei Quartey, a Mysterious Review. Review: Kwei Quartey's compelling debut mystery, Wife of the Gods, introduces Ghanian Detective Inspector Darko Dawson investigating the murder of a medical student in a village some distance from his home (and jurisdiction) in the country's capital of Accra. There are a number of familiar elements to the story including the wise mentor to Dawson. At one point he says to Darko, "You remember what I told you about solving mysteries? ", to which Dawson replies, "That it's a matter of making a few of the connections and the rest will fall in place." And that is really what Wife of the Gods is all about. Acknowledgment: Random House provided an ARC of Wife of the Gods for this review.